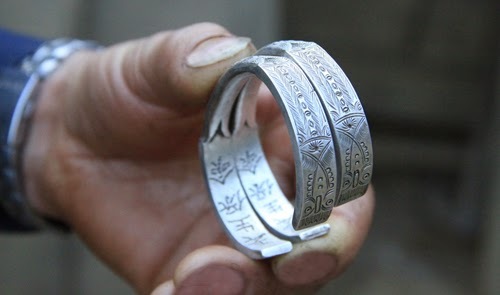 The Dao ethnic people in the northern province of Lao Cai wear matched silver bracelets, and not rings, once a young woman accepts a man's proposal for marriage. Phan Giao Vang, 42, lives in one of the most remote houses in Ta Phin Commune, Sa Pa District. 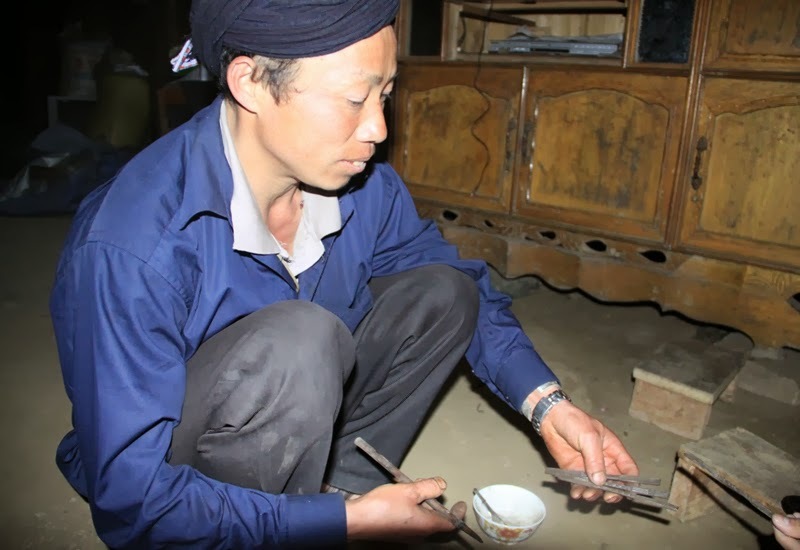 It is located on a mountain top which can only be reached through narrow paths.But despite this, many Dao people, some even from hundreds of kilometers away, make their way to the place to ask Vang to make "proposal" bracelets for their children. Vang, who first made them for his cousin 29 years ago, says he cannot remember how many bracelets he has made. "Whenever their sons reach marriage age, Dao people in Sa Pa come to my place to order bracelets," he says. Ly Quay Phin, a former bracelet maker in Ta Phin who recently became a motorbike-taxi driver, explains the custom -- when a young man finds a potential lover, he tells his parents to get a pair of bracelets, and gives one to the girl. If the girl accepts and keeps the bracelet, it means she has accepted his proposal, he says. A boy can give someone a bracelet three times, but if she returns it each time, he must understand that she does not want to become his wife, he says. Once a girl accepts a proposal, the bracelets remain on the couple's hands all their life. According to Vang, the open cuff bracelet is made of silver and often engraved with the couple's names and images of butterflies, dragons or just their eyes, water melon seeds, or rice grains.Sometimes tourists ask him to make bracelets for their children, but he refuses because he does not make single bracelets, only pairs. For the Dao, a paired bracelet worn by a man and a woman is like a marriage certificate, and shows their fidelity and happiness until death, he explains. However, some women give their own bracelet and their husband's to their son and daughter-in-law as gifts of love and trust, he says. Ask about his work and Vang shows his tools -- a hand torch, an iron bowl for melting silver, and a small chisel -- and says it takes him at least three days to make a pair. He can work only until noon because there is not enough sunlight after that. According to Phin, the Dao traditionally made jewels out of Thai silver coins, but since a coin now costs VND800,000-1.3 million, many have switched to aluminum except in the case of 'proposal' bracelets. May, Vang's wife, is one of the few women to have silver jewelry. The 40-year-old woman is proud of her red headscarf embellished with 36 pairs of corn kernel-sized bells made from 12 silver coins and 36 French Indochina coins. "Many people have asked to buy [my scarf] but I refuse," she says. It was made by her husband, who says the task took him almost a year. Vang says he can only make a pair of bells a day because he has to flatten the coins, shine them, engrave decorative details, and make them into bells with a small silver clapper inside.